Hello! Happy Hump day! Whoop whoop. 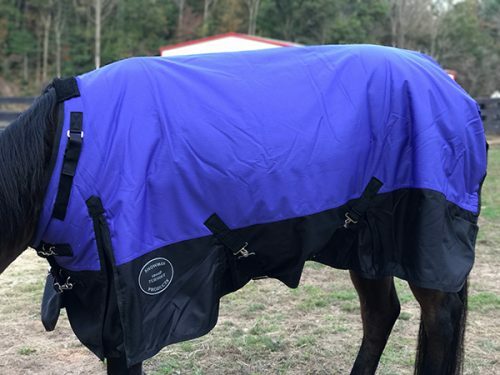 🙂 Since today is the first really cold winter like day we’re having in NC, I thought it would be perfect for sharing a review with you on a new horse blanket I just got for Gracie. Unfortunately, this year I had to buy her a new one because she ripped her old one which made it not so waterproof anymore. Thankfully, the tear is small in the old one which means I can still use it as an inside blanket. 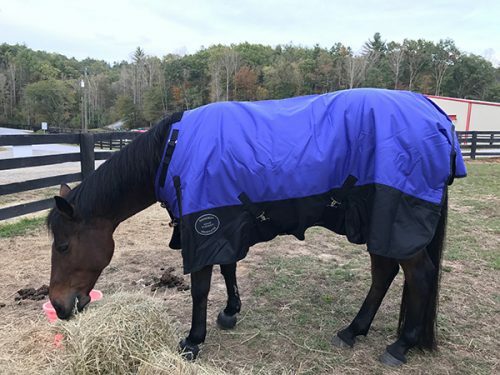 Since I’m a cheap wad and didn’t want to spend a lot of money on a new horse blanket – plus for the price they never seem to last more then 3-4 years – I wanted to buy a blanket that met all my needs and looked good. 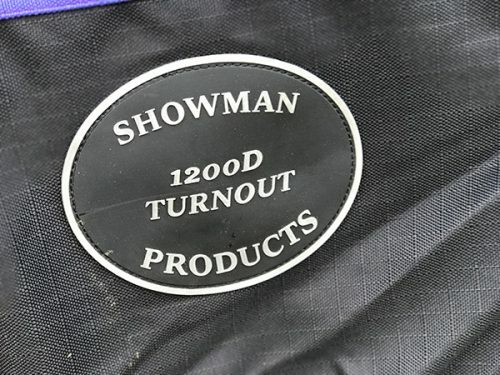 Lucky for me, I found the perfect blanket, a Showman 1200D Turnout Blanket. This particular blanket only comes in 4 colors (blue, purple, burgundy, teal) and in sizes 68-82. I ordered Gracie a size 80 in the purple color which was $80. The price is actually what turned me on to these blankets many years ago. I used to buy expensive blankets ($200+) but they never lasted long. I feel like I had to replace those every year. After replacing so many, I finally decided to buy cheap and give this brand a try. I’m so glad I did too. I first bought this brand when I bought Gracie so almost 5 years ago. At the time, I bought Jet, Vinnie and Gracie a new blanket and each was a bright color. To this day, 4 YEARS LATER!, two of the three blankets are still being used and have no tears in them at all. Rumor took over Gracie’s pink blanket and Jet still has his bright orange blanket. Vinnie’s blanket went to Gracie when he passed away and it just ripped the end of last year. Again, a small rip that I likely could have had someone repair but I wanted a heavier blanket for Gracie anyway, so I bought a new one. This new blanket is awesome! Gracie got to wear the blanket for the first time when I took her to Dupont to trail ride and camp. It definitely kept her warm and fit like a glove. 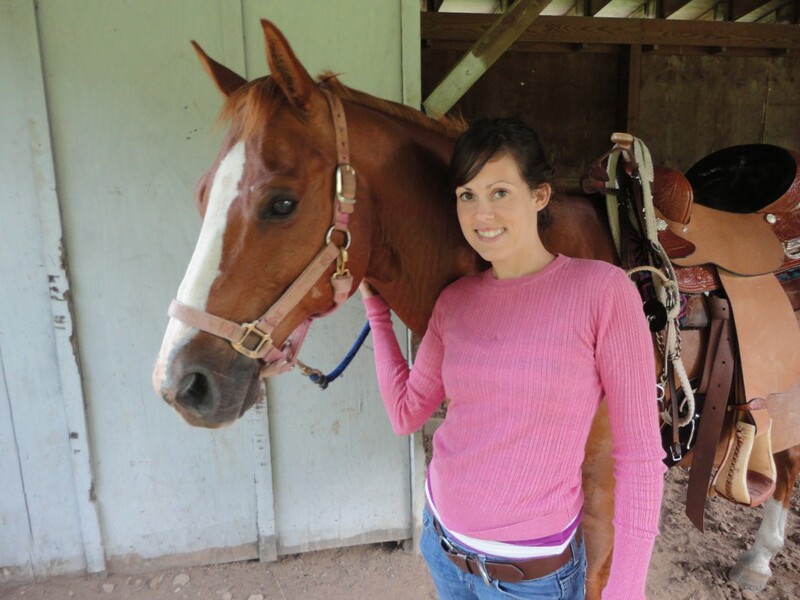 Her shoulders showed no signs of rub marks and the blanket was still in place after wearing it all night in the pasture. The color of this blanket is so vivid and pretty. I love how the front velcros together and snaps. It makes it so easy to take the blanket off when I don’t have to undo the straps like you would a belt. 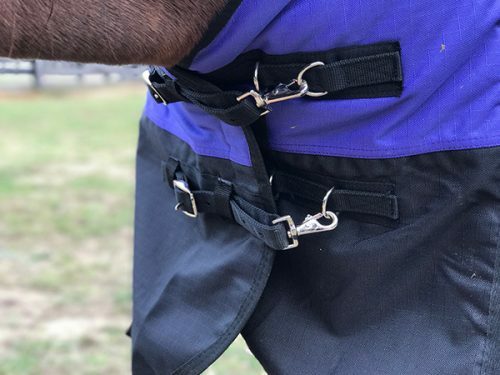 The neck strap is velcro so it’s easy to adjust as well. The first blanket I got Gracie was an 82 which was a little big for her (and definitely huge on Rumor) so this time I went down to an 80. That size fits her perfect. 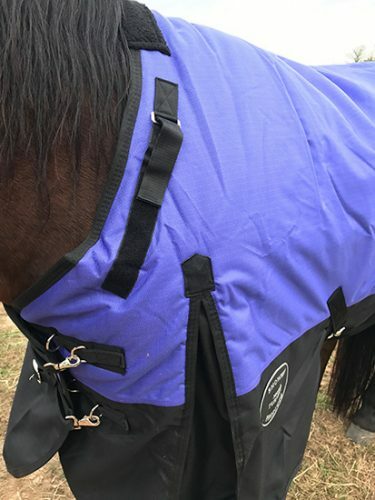 It’s too early for snow and hasn’t rained when the horses have needed to wear a blanket, so I can’t speak to how well the waterproofing is on this particular blanket; But, if it’s like the other ones I’ve bought, then I’m sure it will stay nice and dry during wet weather. All in all, this brand of horse blankets is a very good buy for the price. I highly recommend them and will continue to keep buying them when mine need replacing. You can’t beat an $80 blanket that holds up for 4 winter wears. As a note, I buy these through a friend that is a dealer for this brand, so if you would like to purchase one from her, shoot me an email. I’ll gladly put you in contact with her and she can order you this blanket or any of the other showman horse blankets that suit your need. What blanket brand is your favorite?